16 B None No Power Seat 16 B is a standard Business Class seat. 19 D None No Power Seat 19 D is a standard Business Class seat that may have some extra legroom due to the exit. 19 G None No Power Seat 19 G is a standard Business Class seat that may have some extra legroom due to the exit. 20 A None No Power Seat 20 A is a standard Business Class seat that may have some extra legroom due to the exit. 20 K None No Power Seat 20 K is a standard Business Class seat that may have some extra legroom due to the exit. 23 B None No Power Seat 23 B is a standard Business Class seat however, the close proximity to the bar may be bothersome. 23 D None No Power Seat 23 D is a standard Business Class seat however, the close proximity to the bar may be bothersome. 23 G None No Power Seat 23 G is a standard Business Class seat however, the close proximity to the bar may be bothersome. 23 J None No Power Seat 23 J is a standard Business Class seat however, the close proximity to the bar may be bothersome. 24 A None No Power Seat 24 A is a standard Economy Class seat that may have slightly restricted legroom due to the position of the bulkhead and is missing a window. The proximity to the lavatories and galley may be bothersome. 24 B None No Power Seat 24 B is a standard Economy Class seat that may have slightly restricted legroom due to the position of the bulkhead. The proximity to the lavatories and galley may be bothersome. 24 J None No Power Seat 24 J is a standard Economy Class seat that may have slightly restricted legroom due to the position of the bulkhead. The proximity to the lavatories and galley may be bothersome. 24 K None No Power Seat 24 K is a standard Economy Class seat that may have slightly restricted legroom due to the position of the bulkhead and is missing a window. The proximity to the lavatories and galley may be bothersome. 25 D None No Power Seat 25 D is a standard Economy Class seat that may have slightly extra legroom due to the position of the bulkhead however, the proximity to the lavatories and galley may be bothersome. 25 E None No Power Seat 25 E is a standard Economy Class seat that may have slightly extra legroom due to the position of the bulkhead however, the proximity to the lavatories and galley may be bothersome. 25 F None No Power Seat 25 F is a standard Economy Class seat that may have slightly extra legroom due to the position of the bulkhead however, the proximity to the lavatories and galley may be bothersome. 25 G None No Power Seat 25 G is a standard Economy Class seat that may have slightly extra legroom due to the position of the bulkhead however, the proximity to the lavatories and galley may be bothersome. 39 A None No Power Seat 39 A is a standard Economy Class seat however, the proximity to the lavatory and galleys may be bothersome. 39 B None No Power Seat 39 B is a standard Economy Class seat however, the proximity to the lavatory and galleys may be bothersome. 39 D None No Power Seat 39 D is a standard Economy Class seat however, the proximity to the lavatory and galleys may be bothersome. 39 E None No Power Seat 39 E is a standard Economy Class seat however, the proximity to the lavatory and galleys may be bothersome. 39 F None No Power Seat 39 F is a standard Economy Class seat however, the proximity to the lavatory and galleys may be bothersome. 39 G None No Power Seat 39 G is a standard Economy Class seat however, the proximity to the lavatory and galleys may be bothersome. 39 J None No Power Seat 39 J is a standard Economy Class seat however, the proximity to the lavatory and galleys may be bothersome. 39 K None No Power Seat 39 K is a standard Economy Class seat however, the proximity to the lavatory and galleys may be bothersome. 41 A None No Power Seat 41 A is a standard Economy Class seat that has extra legroom however, it may be impeded by the protrusion of the exit door. This seat is also missing a window. The proximity to the lavatories may be bothersome. 41 B None No Power Seat 41 B is a standard Economy Class seat that has extra legroom however, the proximity to the lavatories may be bothersome. 41 J None No Power Seat 41 J is a standard Economy Class seat that has extra legroom however, the proximity to the lavatories may be bothersome. 41 K None No Power Seat 41 K is a standard Economy Class seat that has extra legroom however, it may be impeded by the protrusion of the exit door. This seat is also missing a window. The proximity to the lavatories may be bothersome. 45 D None No Power Seat 45 D is a standard Economy Class seat that has extra legroom due to the position of the bulkhead. 45 E None No Power Seat 45 E is a standard Economy Class seat that has extra legroom due to the position of the bulkhead. 45 F None No Power Seat 45 F is a standard Economy Class seat that has extra legroom due to the position of the bulkhead. 45 G None No Power Seat 45 G is a standard Economy Class seat that has extra legroom due to the position of the bulkhead. 50 A None No Power Seat 50 A is a standard Economy Class seat that may have limited recline. The proximity to the galley may be bothersome. 50 B None No Power Seat 50 B is a standard Economy Class seat that may have limited recline. The proximity to the galley may be bothersome. 50 C None No Power Seat 50 C is a standard Economy Class seat that may have limited recline. The proximity to the galley may be bothersome. 50 H None No Power Seat 50 H is a standard Economy Class seat that may have limited recline. The proximity to the galley may be bothersome. 50 J None No Power Seat 50 J is a standard Economy Class seat that may have limited recline. The proximity to the galley may be bothersome. 50 K None No Power Seat 50 K is a standard Economy Class seat that may have limited recline. The proximity to the galley may be bothersome. 51 D None No Power Seat 51 D is a standard Economy Class seat that may have limited recline. The proximity to the galley may be bothersome. 51 E None No Power Seat 51 E is a standard Economy Class seat that may have limited recline. The proximity to the galley may be bothersome. 51 F None No Power Seat 51 F is a standard Economy Class seat that may have limited recline. The proximity to the galley may be bothersome. 51 G None No Power Seat 51 G is a standard Economy Class seat that may have limited recline. The proximity to the galley may be bothersome. 52 A None No Power Seat 52 A is a standard Economy Class seat that has extra legroom due to the position of the bulkhead however, the proximity to the galley may be bothersome. 52 B None No Power Seat 52 B is a standard Economy Class seat that has extra legroom due to the position of the bulkhead however, the proximity to the galley may be bothersome. 52 C None No Power Seat 52 C is a standard Economy Class seat that has extra legroom due to the position of the bulkhead however, the proximity to the galley may be bothersome. 52 D None No Power Seat 52 D is a standard Economy Class seat that has restricted legroom due to the position of the bulkhead. The proximity to the galley may be bothersome. 52 E None No Power Seat 52 E is a standard Economy Class seat that has restricted legroom due to the position of the bulkhead. The proximity to the galley may be bothersome. 52 F None No Power Seat 52 F is a standard Economy Class seat that has restricted legroom due to the position of the bulkhead. The proximity to the galley may be bothersome. 52 G None No Power Seat 52 G is a standard Economy Class seat that has restricted legroom due to the position of the bulkhead. The proximity to the galley may be bothersome. 52 H None No Power Seat 52 H is a standard Economy Class seat that has extra legroom due to the position of the bulkhead however, the proximity to the galley may be bothersome. 52 J None No Power Seat 52 J is a standard Economy Class seat that has extra legroom due to the position of the bulkhead however, the proximity to the galley may be bothersome. 52 K None No Power Seat 52 K is a standard Economy Class seat that has extra legroom due to the position of the bulkhead however, the proximity to the galley may be bothersome. 6 E None No Power Seat 6 E is a standard Business Class seat however, the close proximity to the lavatory and galleys may be bothersome. 6 F None No Power Seat 6 F is a standard Business Class seat however, the close proximity to the lavatory and galleys may be bothersome. 65 A None No Power Seat 65 A is a standard Economy Class seat that may have limited recline. The proximity to the lavatories may be bothersome. 65 B None No Power Seat 65 B is a standard Economy Class seat that may have limited recline. The proximity to the lavatories may be bothersome. 65 C None No Power Seat 65 C is a standard Economy Class seat that may have limited recline. The proximity to the lavatories may be bothersome. 65 D None No Power Seat 65 D is a standard Economy Class seat that may have limited recline. The proximity to the lavatories may be bothersome. 65 E None No Power Seat 65 E is a standard Economy Class seat that may have limited recline. The proximity to the lavatories may be bothersome. 65 F None No Power Seat 65 F is a standard Economy Class seat that may have limited recline. The proximity to the lavatories may be bothersome. 65 G None No Power Seat 65 G is a standard Economy Class seat that may have limited recline. The proximity to the lavatories may be bothersome. 65 H None No Power Seat 65 H is a standard Economy Class seat however, the proximity to the lavatories may be bothersome. 66 H None No Power Seat 66 H is a standard Economy Class seat that may have limited recline. The proximity to the lavatories may be bothersome. 66 J None No Power Seat 66 J is a standard Economy Class seat that may have limited recline. The proximity to the lavatories may be bothersome. 66 K None No Power Seat 66 K is a standard Economy Class seat that may have limited recline. The proximity to the lavatories may be bothersome. 67 B None No Power Seat 67 B is a standard Economy Class seat that has extra legroom however, the proximity to the lavatories may be bothersome. 67 C None No Power Seat 67 C is a standard Economy Class seat that has extra legroom however, the proximity to the lavatories may be bothersome. 67 D None No Power Seat 67 D is a standard Economy Class seat that has extra legroom however, the proximity to the lavatories may be bothersome. 67 E None No Power Seat 67 E is a standard Economy Class seat that has extra legroom however, the proximity to the lavatories may be bothersome. 67 F None No Power Seat 67 F is a standard Economy Class seat that has extra legroom however, the proximity to the lavatories may be bothersome. 67 G None No Power Seat 67 G is a standard Economy Class seat that has extra legroom however, the proximity to the lavatories may be bothersome. 67 H None No Power Seat 67 H is a standard Economy Class seat that has extra legroom however, the proximity to the lavatories may be bothersome. 67 J None No Power Seat 67 J is a standard Economy Class seat that has extra legroom however, the proximity to the lavatories may be bothersome. 68 A None No Power Seat 68 A is a standard Economy Class seat that has extra legroom due to the missing seat in front. 68 K None No Power Seat 68 K is a standard Economy Class seat that has extra legroom due to the missing seat in front. 78 D None No Power Seat 78 D is a standard Economy Class seat that may have limited recline. The proximity to the galleys may be bothersome. 78 E None No Power Seat 78 E is a standard Economy Class seat that may have limited recline. The proximity to the galleys may be bothersome. 78 F None No Power Seat 78 F is a standard Economy Class seat that may have limited recline. The proximity to the galleys may be bothersome. 78 G None No Power Seat 78 G is a standard Economy Class seat that may have limited recline. The proximity to the galleys may be bothersome. 79 A None No Power Seat 79 A is a standard Economy Class seat that may have limited recline. The proximity to the galleys may be bothersome. 79 B None No Power Seat 79 B is a standard Economy Class seat that may have limited recline. The proximity to the galleys may be bothersome. 79 C None No Power Seat 79 C is a standard Economy Class seat that may have limited recline. The proximity to the galleys may be bothersome. 79 H None No Power Seat 79 H is a standard Economy Class seat that may have limited recline. The proximity to the galleys may be bothersome. 79 J None No Power Seat 79 J is a standard Economy Class seat that may have limited recline. The proximity to the galleys may be bothersome. 79 K None No Power Seat 79 K is a standard Economy Class seat that may have limited recline. The proximity to the galleys may be bothersome. 80 A None No Power Seat 80 A is a standard Economy Class seat that has extra legroom however, it may be impeded by the protrusion of the exit door. The proximity to the galleys may be bothersome. 80 B None No Power Seat 80 B is a standard Economy Class seat that has extra legroom however, the proximity to the galleys may be bothersome. 80 C None No Power Seat 80 C is a standard Economy Class seat that has extra legroom however, the proximity to the galleys may be bothersome. 80 H None No Power Seat 80 H is a standard Economy Class seat that has extra legroom however, the proximity to the galleys may be bothersome. 80 J None No Power Seat 80 J is a standard Economy Class seat that has extra legroom however, the proximity to the galleys may be bothersome. 80 K None No Power Seat 80 K is a standard Economy Class seat that has extra legroom however, it may be impeded by the protrusion of the exit door. The proximity to the galleys may be bothersome. 81 D None No Power Seat 81 D is a standard Economy Class seat that has extra legroom however, the proximity to the galleys may be bothersome. 81 E None No Power Seat 81 E is a standard Economy Class seat that has extra legroom however, the proximity to the galleys may be bothersome. 81 F None No Power Seat 81 F is a standard Economy Class seat that has extra legroom however, the proximity to the galleys may be bothersome. 81 G None No Power Seat 81 G is a standard Economy Class seat that has extra legroom however, the proximity to the galleys may be bothersome. 82 C None No Power Seat 82 C is a standard Economy Class seat. 82 H None No Power Seat 82 H is a standard Economy Class seat. 83 A None No Power Seat 83 A is a standard Economy Class seat. 83 B None No Power Seat 83 B is a standard Economy Class seat. 83 C None No Power Seat 83 C is a standard Economy Class seat. 83 D None No Power Seat 83 D is a standard Economy Class seat. 83 E None No Power Seat 83 E is a standard Economy Class seat. 83 F None No Power Seat 83 F is a standard Economy Class seat. 83 G None No Power Seat 83 G is a standard Economy Class seat. 83 H None No Power Seat 83 H is a standard Economy Class seat. 83 J None No Power Seat 83 J is a standard Economy Class seat. 83 K None No Power Seat 83 K is a standard Economy Class seat. 84 A None No Power Seat 84 A is a standard Economy Class seat. 84 B None No Power Seat 84 B is a standard Economy Class seat. 84 C None No Power Seat 84 C is a standard Economy Class seat. 84 D None No Power Seat 84 D is a standard Economy Class seat. 84 E None No Power Seat 84 E is a standard Economy Class seat. 84 F None No Power Seat 84 F is a standard Economy Class seat. 84 G None No Power Seat 84 G is a standard Economy Class seat. 84 H None No Power Seat 84 H is a standard Economy Class seat. 84 J None No Power Seat 84 J is a standard Economy Class seat. 84 K None No Power Seat 84 K is a standard Economy Class seat. 85 A None No Power Seat 85 A is a standard Economy Class seat. 85 B None No Power Seat 85 B is a standard Economy Class seat. 85 C None No Power Seat 85 C is a standard Economy Class seat. 85 D None No Power Seat 85 D is a standard Economy Class seat. 85 E None No Power Seat 85 E is a standard Economy Class seat. 85 F None No Power Seat 85 F is a standard Economy Class seat. 85 G None No Power Seat 85 G is a standard Economy Class seat. 85 H None No Power Seat 85 H is a standard Economy Class seat. 85 J None No Power Seat 85 J is a standard Economy Class seat. 85 K None No Power Seat 85 K is a standard Economy Class seat. 86 A None No Power Seat 86 A is a standard Economy Class seat. 86 B None No Power Seat 86 B is a standard Economy Class seat. 86 C None No Power Seat 86 C is a standard Economy Class seat. 86 D None No Power Seat 86 D is a standard Economy Class seat. 86 E None No Power Seat 86 E is a standard Economy Class seat. 86 F None No Power Seat 86 F is a standard Economy Class seat. 86 G None No Power Seat 86 G is a standard Economy Class seat. 86 H None No Power Seat 86 H is a standard Economy Class seat. 86 J None No Power Seat 86 J is a standard Economy Class seat. 86 K None No Power Seat 86 K is a standard Economy Class seat. 87 A None No Power Seat 87 A is a standard Economy Class seat. 87 B None No Power Seat 87 B is a standard Economy Class seat. 87 C None No Power Seat 87 C is a standard Economy Class seat however, the proximity to the lavatories may be bothersome. 87 D None No Power Seat 87 D is a standard Economy Class seat in the last row of the aircraft that may have limited recline. The proximity to the lavatories and galley may be bothersome. 87 E None No Power Seat 87 E is a standard Economy Class seat in the last row of the aircraft that may have limited recline. The proximity to the lavatories and galley may be bothersome. 87 F None No Power Seat 87 F is a standard Economy Class seat in the last row of the aircraft that may have limited recline. The proximity to the lavatories and galley may be bothersome. 87 G None No Power Seat 87 G is a standard Economy Class seat in the last row of the aircraft that may have limited recline. The proximity to the lavatories and galley may be bothersome. 87 H None No Power Seat 87 H is a standard Economy Class seat however, the proximity to the lavatories may be bothersome. 87 J None No Power Seat 87 J is a standard Economy Class seat. 87 K None No Power Seat 87 K is a standard Economy Class seat. 88 A None No Power Seat 88 A is a standard Economy Class seat in the last row of the aircraft that may have limited recline. The proximity to the lavatories and galley may be bothersome. 88 B None No Power Seat 88 B is a standard Economy Class seat in the last row of the aircraft that may have limited recline. The proximity to the lavatories and galley may be bothersome. 88 C None No Power Seat 88 C is a standard Economy Class seat in the last row of the aircraft that may have limited recline. The proximity to the lavatories and galley may be bothersome. 88 H None No Power Seat 88 H is a standard Economy Class seat in the last row of the aircraft that may have limited recline. The proximity to the lavatories and galley may be bothersome. 88 J None No Power Seat 88 J is a standard Economy Class seat in the last row of the aircraft that may have limited recline. The proximity to the lavatories and galley may be bothersome. 88 K None No Power Seat 88 K is a standard Economy Class seat in the last row of the aircraft that may have limited recline. The proximity to the lavatories and galley may be bothersome. Every Business Class seat is equipped with a regular 110v AC power port. In Economy, the power ports are located between the seats. 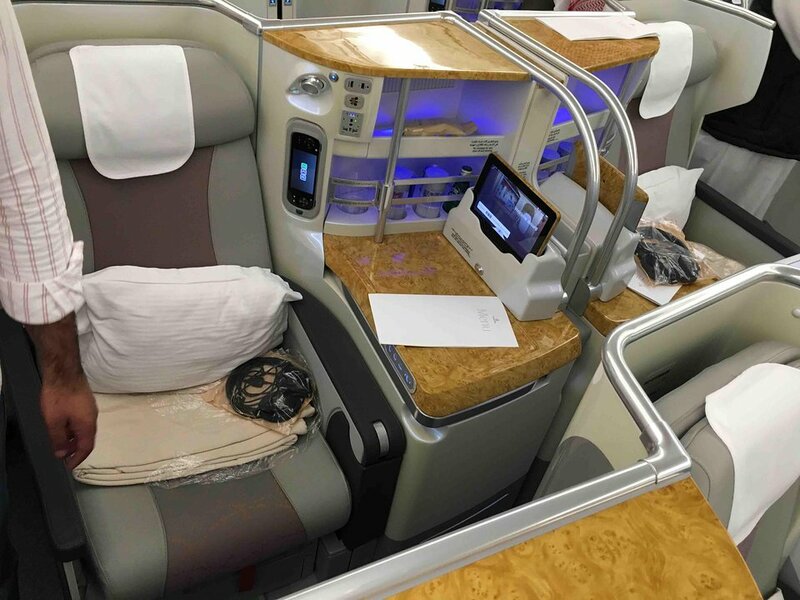 This version has a total of 58 flat bed Business Class seats, and 557 standard Economy Class seats. This aircraft operates with two classes of service. Business Class is in a staggered pattern with most seats having direct access to the aisle and a pair of seats down the centre. Beware seat 80A and 80K in the two class layout A380 (whole lower deck Economy). This is an exit row seat but the emergency exit slide means it sticks out into the leg space, limiting room, particularly for tall travellers. I'm 6' 4" / 193cm and had to swap with 80H - though this is an aisle seat next to the galley so you often get bashed (same for 80C). 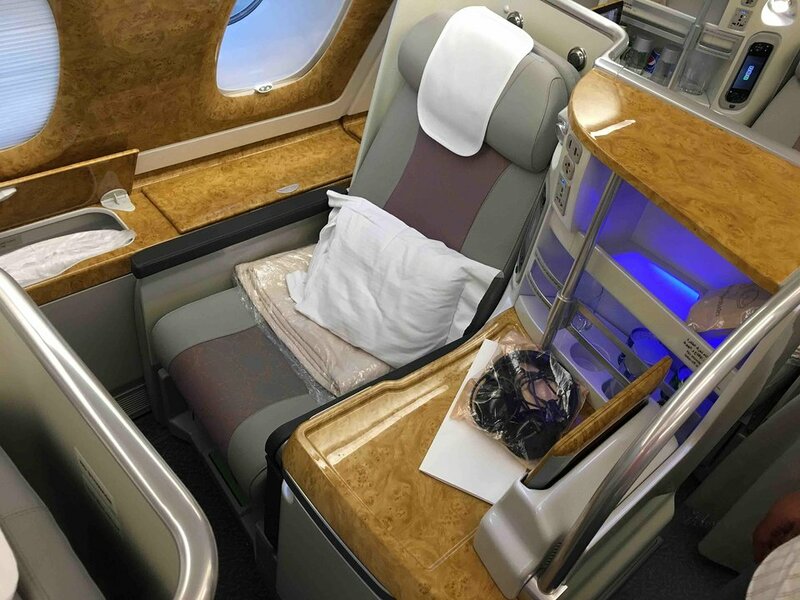 Steward confirmed that 68A and 68K are the pick of the extra legroom economy seats on 2 class Emirates A380. Overall not a bad seat, but a few things to add to the general comments. A and K seats are good to go for in the upper deck as you get some storage between your seat and the window. Secondly rows 34-39 were completely empty on my flight, I'm not sure for the reason for that, but it may be to do with my next point. The first exit door on the upper deck is between rows 33 and 34, not between economy and business class as shown on the chart. We disembarked from this door and on this flight economy passengers were held until the business passengers had disembarked. This seat is on the upper floor.It is very convenient and it provides great legroom.Together with 33B are very cozy,because they are twin seats. As families with very small children (babies) are placed in row 24A-K, you should avoid row 25-26-27-28 if you do not want to spend you trip among crying babies! Emirates does not state anything about "family" row 24 & 41 & 52 on their homepage. For A380-800 two class The boarding gates for the upper deck is at the mid of the Economy rows - somewhere around row 32 or 33. So the Business class passenger have to go past the Economy passengers(and somehow they board earlier!). And during arrival, the Economy passenger go down before the Business passengers! This defeats the priority for the Business passengers. 19G is next to the Bassinet, gives extra table space but is also next to the exit which is used by staff to keep mattresses etc. and chatter all night. There is no extra leg room. Two abreast seating is a dream compared to three abreast in other 380 configs. Highly recommend if you can find it. 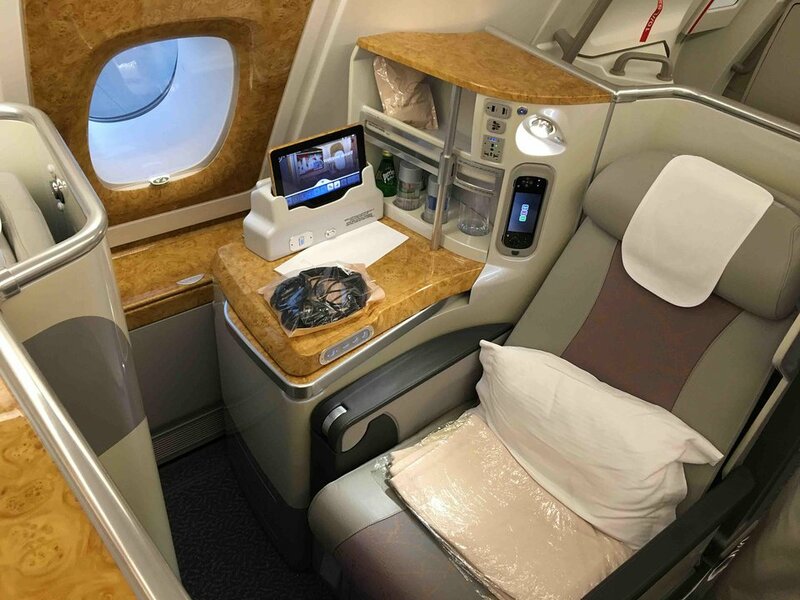 i had an experience of travelling in 380 to YYZ during 2010 n 2014.then last year sept-oct 2016 to JFK.It s awesome travel experience with the helpful cooperative cres n staff.As saying goes "Sky the is limit"i wish emirates limitless success.all the best. This was the best flight i ever had, great seat, great entertainment, awesome food and nice flight attendants. The two-class upstairs economy was the best we've ever flown. The 2-4-2 configuration ensures plenty of room if you are in the 2 window seats. The storage container under the window is fantastic with plenty of room to ensure nothing needs to be at your feet or in the pockets. Service was excellent, bathrooms large and clean, entertainment systems very good and food was nicely cooked. The 2-4-2 configuration on the upper deck is a winner! Of the over 100 flights I have had in the economy section of wide bodied aircraft, not one compares. The seat seems to be wider, and more distant from the one in front of you. Plus,, there is a cabinet next to the seat for in-flight stuff. Look out for two class! Being on the lower deck, the body curves away from the window seat, which means an additional 20cm of shoulder room to lean into. Legroom was good too, good spacing between you and the seat in front. In flight entertainment system very good, nice big clear screen, with power and usb charging facilities. Seats not too narrow, with plenty of foot space underneath the seat in front. I flew from Dusseldorf to Dubai with this aircraft. Seat 52H is a good one for anyone with bigger posture. There was no basinet or anything in front of me so I could stretch my legs as much as I wanted. The only downside is the light, the noise coming from the galley. But given the comfort it is a good trade-off. You might not be able to stretch your left foot as people tend to evade the open area. Also the flight crew might place the cart right in front of you. I flew recently in seat 33B on the upper deck flight EK376 DXB-BKK, the seating plan shown for the Emirates two class is incorrect as there is an exit behind this seat 33B. It does not effect the recline of seat and found it extremely comfortable. Couldn't even hear the engines throughout the flight, Would recommend economy upstairs if you can.